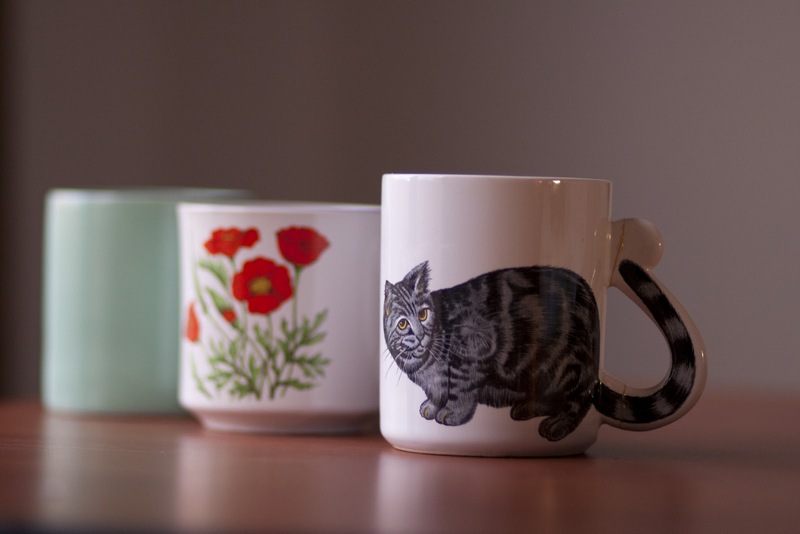 I must admit, I have an unhealthy collection of ... Mugs. Yes, the clunky, ceramic, tea-holding, cups. 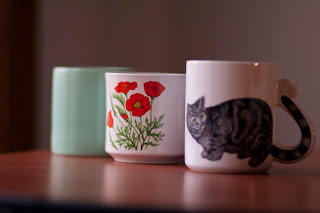 It all started with a pair of vintage stack-able mugs I found on Etsy last year. I soon came across some at a local thriftstore and ever since then the collection has amassed to many boxes (no more counter space...). This collection has also helped drive one of my ultimate dreams, to have a completely mis-matched kitchen, with most of the items being pre-owned/found at thrift stores. With each plate, fork, knife, spoon, tea cup and tupper ware of a different style and/or color. There is just something about giving a new life to something once loved that intrigues me, plus, eco-friendly! It's a rather crazy obsession, and I had no idea anyone else felt the same way, until I started reading other peoples blogs. I am SO glad there are so many of us thrift seekers, vintage lovers, re-purposing, DIY-ers out and about! With that being said, I will start posting some of my mugs form my collection every week! I just found some new ones at my local Salvation Army (where most of my mugs have come from, not sure why, but they always have so many, and for only .49 cents each, and half price on yellow tag days!!) and I have been wanting to share them with the world, as one of them is just fantastic and my new Favorite! 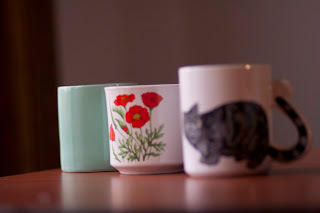 And lastly this seemingly plain mug on the end is in my most favorite color ever: turquoise. It's a huge mug, and it holds one very large cup of tea, I love it!